Which instance would cause someone to want to know more about Cindy? Which would cause people to think Cindy is full of herself? There is no arguing that what someone else says about you is perceived as more credible, and with more interest, than if you said it yourself. Of course I’m talking about one of your greatest promotional tools: testimonials. Most coaches don’t use them often enough. Because they don’t get them often enough. Not because they don’t do a great job with their clients. They simply don’t ask enough. In the right way. Or at the right time. 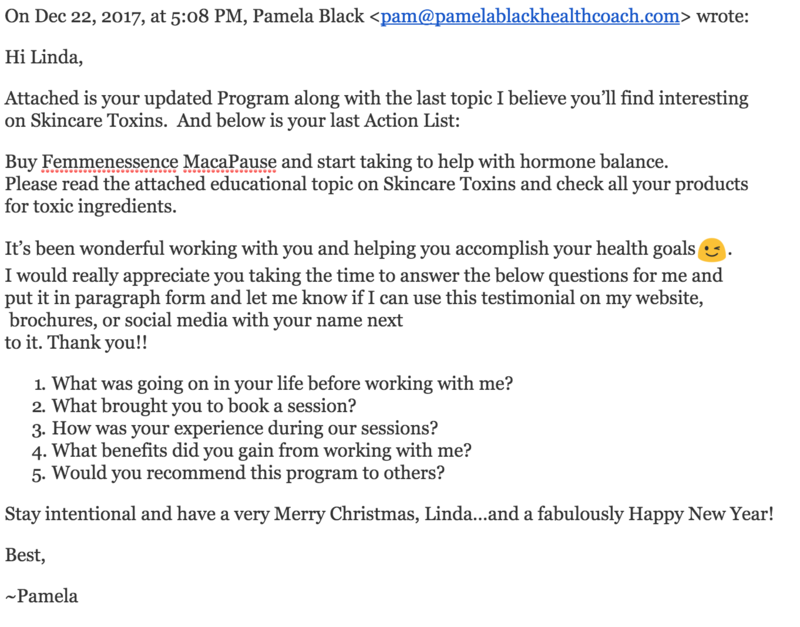 I’m going to share a simple process to help you get glowing testimonials, and also enhance the chances your clients will refer you more often. First, the right time to ask is when you have helped your client achieve their goals, and they have told you how pleased they are. If you can combine your request with something else of value you are providing them, all them better, since the law of reciprocity is in your favor. At the end of your communication I suggest you use or adapt the wording I used with an actual client below. A few points about why I said what I did. I let her know how I would use her words, and ask permission to do so, along with her name. Now, I might, or might not use all of that on my site. And I can use pieces of it all over. Would Linda have sent that to me without asking for it? I doubt it. She still would have been pleased with our work together and her results, but then I would be hoping that she would share that with other people. And of course I thanked Linda for that great testimonial, and told her I would also appreciate if she would share her story with others she feels could benefit like she did, and left her with plenty of my cards to give to them. If you have happy clients, you have amazing testimonials just waiting to be written and unleashed to the world so others can benefit as well. You just need to follow a simple process. Please let me know how you do. I’d love to see your requests and your testimonials. Please reach out and friend me on Facebook (Pamela Black) and share your stories… I’d love to hear them! Pam is a Holistic Health and Wellness Coach and has helped hundreds of clients personally, and many more through her videos, articles, and other resources. She have developed and refined systems and programs that help her to efficiently and effectively work with her clients and provide them an amazing experience and results. And she has methods for enjoying multiple streams of ongoing income, while helping her clients. 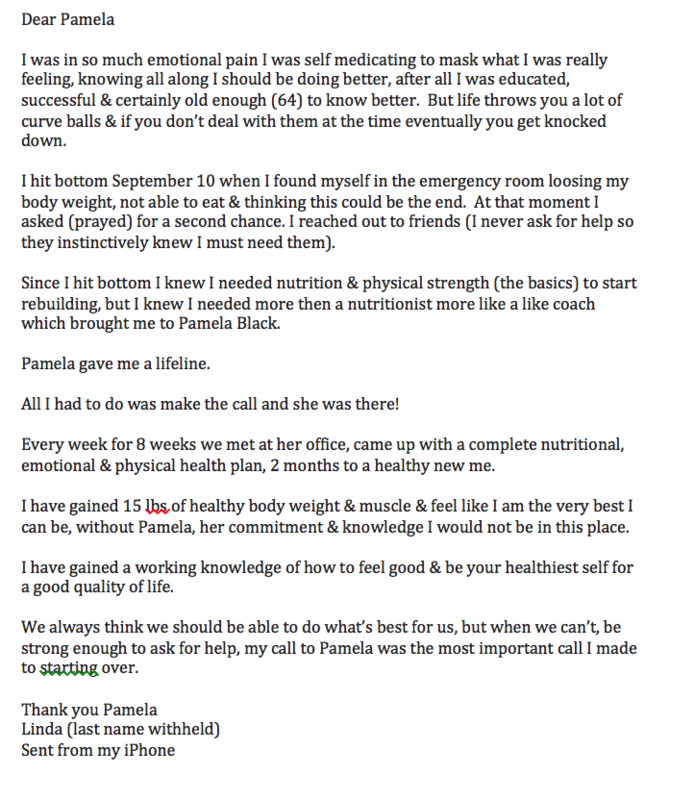 Contact her at Pam@PamelaBlackHealthCoach.com.